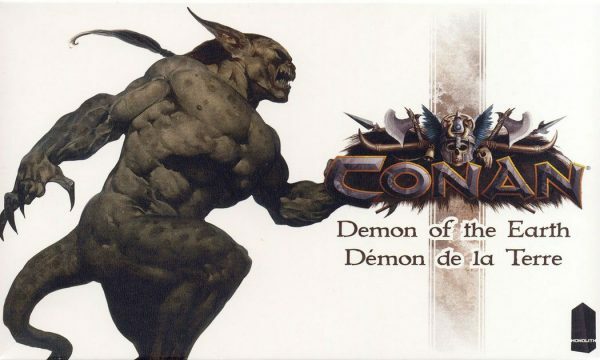 Conan Kickstarter’s Demon of the Earth | Azazel's Bitz Box. Today we have another model from the Conan Kickstarter. This time it’s the Demon of the Earth! I took painting cues from both the box art as well as the painted minis by Martin Grandbarbe. 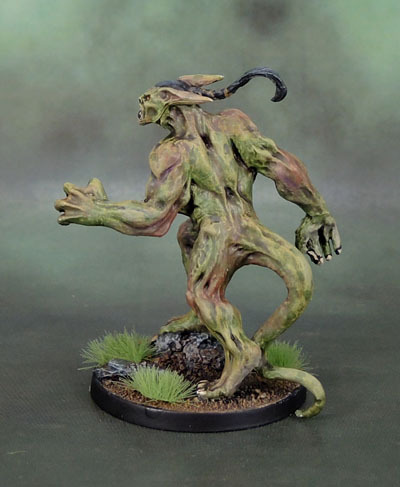 Not trying to copy him directly, (the model isn’t good enough in my opinion to try that hard, though Martin’s work is absolutely lovely) but take some influence, as the plain greenshades taken from the art leaves the model more than a little plain. 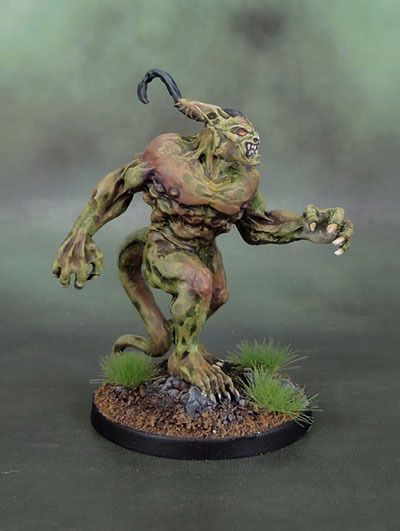 Also a cue taken from Martin’s page is a hint as to what the hell this model is supposed to be – perhaps a demon vassal of Thugra Kotan, who is a Stygian sorcerer character from the story “Black Colossus“. I initially tried to ape the box art, but the dapples in the green skin looked bad, and then when I tried to unify them with the rest of the flesh with a glaze and wash, they still looked sub-par. 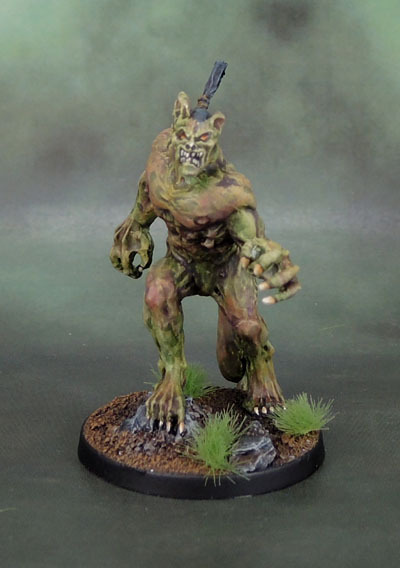 So then, influenced by Martin’s models, I added in some flesh variations – a ruddy flesh, and then added some ochre highlights and purple shading to give it some interest – because as all shades of green he was severely lacking. Baal-Pteor, Demon of the Earth and a Mentor Legion Space Marine for scale. I’m still not especially keen on this figure, but what can I say? He’s done – and still looks decent for a boardgame model. Certainly good enough for me, once again. On to more and better models now! This entry was posted in Conan Boardgame and tagged Conan Boardgame, Conan Kickstarter, Demon of the Earth, Monolith Games. Bookmark the permalink. Nicely done mate – he’s pretty cool! Very cool! He is a nice generic demon. He could be use in lots of different settings and games. Thanks mate – and very true. It’s definitely a versatile figure. The foot-on-rock does make the striding stance a bit odd. Maybe he’s going for a Leonidas-leap? We’ll never know… but we can only imagine. Yeah, the box art makes it look like that was the intention, too. It’s a bit of a small rock for Leonidas-flight, but hey – close enough I guess! Looks pretty good to me but given the hook on his head you could always hang him out to dry! I’ll just leave him hanging! An interesting choice by the company to make a Model of something that never actually appeared in a story and was just from a line in a villain’s boast-rant. I guess they eventually ran out of stuff that was actually in the stories to include for extra variety. At first I was thinking more browns to tie in with “of the earth”, but then I read the quote about it and he also raves about “lizards of the earth”, so I’m guessing it just means that it’s somehow from earth rather than from some farther celestial sphere or something. The green and flesh mottled together looks good for it. Looks like you’ve got a paragraph from Baal-Pteor’s post copypastaed in the middle there. Also, whenever I read the name, I hear it in Egg Shen’s voice, from Big Trouble in Little China, when he’s talking about “black blood of the Earth”. That might well be the case – he was an optional add-on (as was Baal-Peter), so I guess it makes sense in a way that (many of?) the more central and important characters were included as stretch goals. I did have the same thoughts as you around “hmm.. green Earth-demon?” but yeah, it doesn’t say “golem” so it doesn’t mean it needs to be made from dirt or mud or stone. Good spot on the paragraph as well – and thanks – fixed! Oh, and you can never go wrong with a bit of Jack Burton and company! Very cool rendition of an earth demon. The browns and greens are well blended, adding some interest to the rather generic miniature. 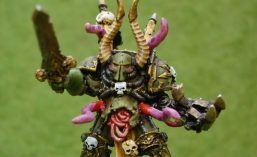 I could see this being a good base mini for conversions. Add some horns or a tail, weapons, spell effects and vary the skin tone and you can depict a multitude of demonic creatures. Nice one. Might not be your fave, but he definitely stood out amongst my Blog feed. Martin Grandbarbe’s painting is pretty nice, and I can see why you liked it. I think I like your colors better overall though. I do really like his base though. Gives it an otherworldly vibe and really pops against the green of the model. Though it seems more like Martian landscape than what one might find under a Tree Earth Demon Thing. Love the blending you did here, takes a lot of patience. Well done !